Bronchitis is a condition that may appear after a cold or flu. It is characterized by the inflammation of the bronchial tubes. These are passages which carry the air between oral cavity and lungs. The usual symptoms are a nasty cough and mucus build-up. It is the reason you will feel a congestion in the chest area and may experience difficulty in breathing. The secretions can get any color from clear to green. Sometimes it is possible to make a weird sound when breathing just like you were whistling. In rarer cases, bronchitis may be accompanied by flu symptoms like low fever, body aches, sore throat or a runny nose. Just like with many other ailments bronchitis may get two forms: acute and chronic. In the acute phase, the symptoms may last for about seven or ten days but after the treatment, they go away, and you are as good as new. The chronic stage is more severe, and the condition will keep coming back putting you at risk of developing an obstructive pulmonary disease. Bronchitis can be caused either by a virus or bacteria. However, the result is the same: the bronchial tubes get swollen, and your body creates more mucus. It is more likely that your cold will turn into bronchitis if the immune system is weakened, you suffer from heartburn, you smoke or inhale irritants. In case you didn’t already know, the good news is that there are several home remedies for bronchitis that may keep you away from over-the-counter-drugs. Turmeric has been widely used in Ayurvedic medicine to treat various diseases and has proven its efficiency for centuries. A close relative of ginger, turmeric contains a compound called curcumin which is a potent antioxidant. It fights against free radicals and has a powerful anti-inflammatory effect. Therefore, it brings tremendous benefits when treating swollen bronchial tubes. There have been some experimental models which proved that this effect is similar to the one of hydrocortisone drugs or phenylbutazone. In addition to that, turmeric also has antiviral and anti-bacterial properties. To use turmeric as a home remedy for bronchitis, you will need to add half of teaspoon of powder to one glass of warm milk. Stir well and drink this mixture three times per day. Make sure that you serve the turmeric milk first thing in the morning on an empty stomach. Cautions: when taken in excess, turmeric may cause unpleasant side effects like indigestion, dizziness, nausea or diarrhea. Pregnant women should also stay away from the orange powder since it can force uterus stimulation. Also breastfeeding mothers are advised to avoid turmeric because there are not sufficient studies over the presence of curcumin in breastmilk and how this can affect a small baby. In addition, if you suffer from gallbladder issues, you have gastric reflux or diabetes and even if you have to take a surgery, don’t ingest turmeric and go for other home remedies. Oregano acts like a natural antibiotic and a strong anti-bacterial agent. It can successfully fight a virus or bacteria in the acute phase of the ailment. This herb is used by holistic healers to treat many types of respiratory illnesses and can imitate the effect of over-the-counter drugs. Usually, people use the essential oil. You should know that these powerful extract should not be ingested without a proper recommendation from a doctor. The best method to get a bronchitis relief by using oregano oil is to inhale the vapors which will lessen the mucus and help you breathe well again. Place the water in a pot over high heat. When it reaches the boiling point, transfer it to a bowl, and add the essential oil. Lean your head over the bowl but pay attention because the steam is hot and you might get burned. Cover your head with a thick towel and breathe in the vapors until the water gets colder. Repeat this procedure once a day until you notice an improvement. Oregano is a potential irritant due to certain chemical compounds it contains so if you feel any discomfort stop following this treatment. Herbs are often used to treat respiratory problems because they can bring instant relief. Ginger is one of the best ingredients to infuse for a tea since it has a lot of great properties including anti-inflammatory and antiviral effect. Combined with black pepper in a herbal tea, it makes a marvelous natural cure for bronchitis. Pour the water into a small pot and place it on the stove over high heat. When it starts to bubble remove from heat. Add the black pepper, ginger, and clove and cover. Let the spices infuse for three to four minutes, and then remove the clove. After the infusion has chilled a little bit, add the honey and stir well until dissolved. Enjoy this drink for two times each day until you notice an improvement in your condition. One of the most use bronchitis remedies is Epsom salt. It is especially efficient in case of acute bronchitis since it helps in reducing the mucus allowing you to breathe normally. Just like the above remedies the salt has anti-inflammatory properties which will reduce the swelling and alleviate the symptoms associated with this disease. If you want to get immediate relief, you will need about two pounds of magnesium sulfate. Simply dissolve it in your bathtub filled with water as warm as you can handle. Enjoy your relaxing bath for twenty to thirty minutes. You will also get rid of any muscular pain or discomfort that may be associated with your condition. In case you suffer from acute bronchitis you need to take the treatment every day. It is best to soak in the magnesium water right before going to bed, so you will allow your body to rest and heal. If you already have chronic bronchitis, warm baths with Epsom salt can be of use when taken twice a week. Used since ancient times for healing various problems of the respiratory tract, salt can help you get rid of bronchitis fast. It will clean up the throat and fight against any bacteria or virus that causes mucus build-up. A saline solution can also soothe the inflammation of the bronchial tubes. Make sure you use filtered or previously boiled water since the tap water may contain some fungi you don’t want in your throat and nasal passages. Add the salt and stir well to dissolve. Gargle with this saline solution two to three times a day to get the desired results. Cautions: Pay attention to the quantity of salt. Using more than one teaspoon can cause irritation. On the other hand, if you only add a pinch, you will see no improvement. So keep the quantity to one teaspoon or a little bit less when preparing the mixture. It is a mandatory step and not only in fighting this particular disease but for the health and well-being of the entire body. A lot of researchers have found that the risk of developing respiratory ailments is higher in smokers than non-smokers. Also, avoid passive smoking and inhaling irritants like harsh pollution, dust, fumes, and vapors that can harm your respiratory tract. It will lessen the mucus stuck in your throat and nose and you will find it easier to breathe. Inflammatory processes may appear anywhere in the body so it is advisable to consume food that keeps the inflammation at low levels. Go for a lot of fruits and veggies and stay away from sugar, processed foods, and gluten. A good idea is to eat foods rich in probiotics. Choose fermented products such as kefir, sauerkraut, kombucha, and yogurt. The best thing is to prepare them at home out of organic produce. The air inside our homes tends to get dry especially in the cold season. Therefore, a humidifier will be of great help to keep your nose and lungs clear of mucus. In acute situations, bring the humidity to a higher level until you get better. Try vitamin C and Echinacea. They are extremely effective because you can’t absorb all the vitamins and minerals you need just from food since it is almost impossible to have a 100% pure and non-processed diet. 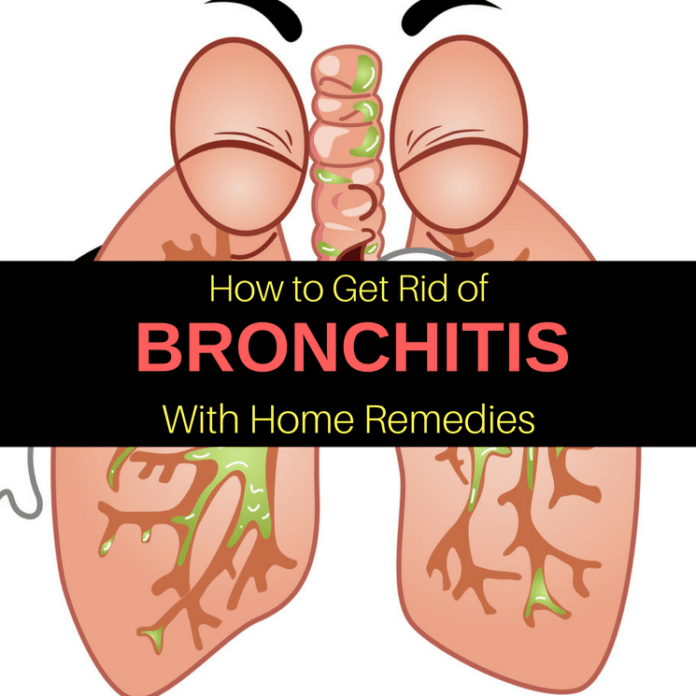 If you use home remedies for bronchitis for more than two weeks and you don’t notice any improvement go check with your doctor to get proper treatment.